Cruise in comfort and arrive in style! 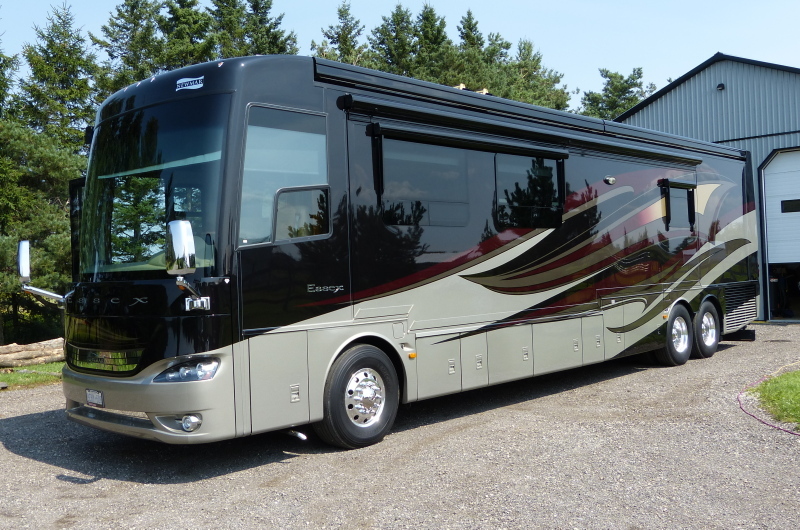 Newmar's Essex Luxury Motor Coach is a premium cruising machine loaded with conveniences and amenities that are second to none. This one-owner, low-mileage coach has the stunning Ginger Glaze high gloss interior finish and Newmar's very stylish, multi-coat Amelia exterior design. A dependable Cummins 500HP diesel coupled with a Spartan chassis gives you all the maneuverability and power you could ask for, and light touch "Comfort Drive Steering" coupled with heated Ultraleather seating with eight-way controls and a brand new GPS guidance system all combine to ensure a delightful cruising experience. Step inside and you are entering a masterpiece of interior design from the forward living area through the galley and into the master bedroom with three-piece en-suite bathroom and cedar-lined storage locker. The polished porcelain floor tiles in kitchen, bathroom and living areas are easily cleaned and are heated for maximum comfort. Mood lighting is recessed in ceiling features, behind valences and below the bed base. Of course there's much more to cruising than plush interior accommodations. Time spent outside is enhanced by a Sony 40" HDTV and stereo system concealed behind an exterior panel and shaded by large retractable sunshades that deploy from the roof at the touch of a button. Multiple power-assisted storage compartments with access from either side allow effortless cargo management. All bedroom and side windows have powered dual day/night window shades for partial screening during the day and total privacy at night. The front entrance door is equipped for keyless entry with a doorbell and has a power operated awning. All major mechanical systems are at your command from multiple touch-screen control panels strategically located throughout the interior. No need to get out of bed to raise the curtains, dim the lights or adjust the heating and cooling systems; it's all right there at your fingertips. Electrical features include a 12.5kW Onan generator with auto-changeover, 50-Amp external service with powered cable rewind, 2800W power inverter with automatic generator start and eight house batteries on a pull-out tray. This is a one-owner, mint-condition, full-featured, professionally maintained motor coach stored in a purpose-built heated building. We've checked current Essex listings and you will be hard-pressed to find a nicer unit on the market anywhere. Located off-site. Please call ahead for viewing appointment.